The leaves are small, linear and spiny-pointed, only about 1 mm wide but vary in length from 8-20 mm. They are concave, with a central white line on the inside, but green and keeled outside. 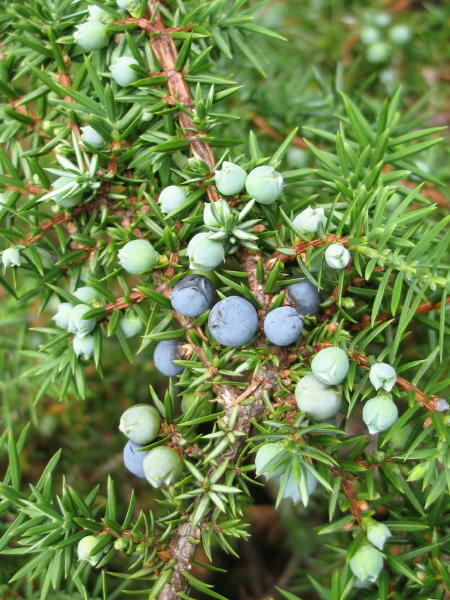 Juniper is an evergreen of chalk downs, heaths, moors and pine or birch woods, varying from a small tree up to 10 m in height to a prostrate, ground-hugging shrub. The latter is the predominant form growing in the mountains of North and West Britain and Ireland. Small yellow male and greenish female flowers, which are usually borne on separate plants, appear in May and June. The fruits, made of 3-8 scales, are on female plants only. They are like small berries, green at first but become blue-black when ripe, 2 years later. The rich, reddish-brown bark shreds and peels in strips. The berries are essential for the flavouring of gin. 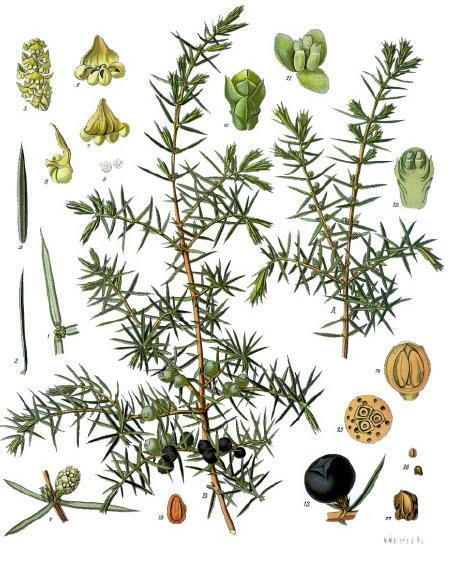 Oil from juniper leaves was used by ancient Egyptians in the mummification of bodies.